Mas El Molladar Masia is surrounded by a natural landscape with a beauty of its own: the protected area of the Alta Garrotxa. The house forms part of a scattered group of houses in Salarça Valley, in the area of Camprodon. To get to the house take the forest road from the Font-Rubí housing estate (approx. 6 km, with four km of tarmac). On the C-17 (Granollers-Vic-Ripoll), and the C-26 to Camprodon and Molló. Continue straight on past two roundabouts, and about 2 km after leaving Camprodon, take a right turn into the GIV-5223 road to Rocabruna/Beget. After 1.8 km enter the Font Rubí housing estate to the right. Take the first lane left, which is called Cami de la Quera, where you will immediately find the Font Rubi Minigolf course on your right. From there follow wooden Molladar signposts to take the forest road which will lead you to the house. The first 4km are of cement, and the final 2km of beaten earth and gravel, in a reasonable condition for all vehicles, except those exceptionally low and/or heavily loaded. 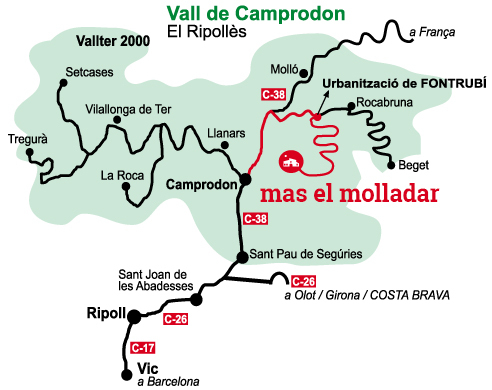 Take the C-26 (Olot-St. Joan de les Abadesses) and then the C-38 to Camprodon/Molló. Then follow the above directions to the house.